At times when nothing works, a good sleep works best! This past week, a challenge that I am faced with, has had me working overtime with our lawyers. It involves a lot of paperwork and preparing a case. Often times, I have woken up in the wee hours to deal with it. So, in a sense, I have been short on the hours of sleep that I normally get. The apartment above ours is going through a complete renovation. All day the workers are knocking away at the floor, ostensibly to remove all the tiles in an effort to re-lay them. The noise from the floor above is deafening and allows no room for even a few minutes of rest and repair during the day. Overall, it has been a very demanding week. That’s when I got a window today – around mid-morning, having completed all the documentation I had to on the legal front, to take a break. But the workers were pounding away above me. I wanted to somehow just catch up on my sleep. I decided to shut out the noise by reminding my mind that I did not hear it (a principle I have mastered through the practice of “mouna” – daily silence periods). In a few minutes of continuously directing my mind, the noise levels became irrelevant. And I fell asleep. I slept for a good four hours, soundly, uninterrupted, and woke up recharged and refreshed. Nothing works like sleep. Nothing quite rejuvenates the way it does. Nothing fills your soul with confidence and conviction more than a few hours of sleep! I have often found that the first casualty of any Life challenge is sleep. Sometimes, the lack of sleep in your Life is not just because of work pressure. But because you are worried, anxious and are despairing over a situation that you are clueless about. Your mind will kid you in such circumstances to stay up without sleep in the hope that you can find a solution to whatever vexes you. Staying up for a few nights to finish assignments and meet deadlines is fine. But inability to sleep because of worry is a no-no. It simply doesn’t help. Sleep deprivation in fact compounds matters. It makes you weak and fatigued. How can you address your Life challenge when, at a physical level, you remain exhausted and spent? So, the golden rule of intelligent living is to not let anything come between you and your sleep cycle. If for a few days your sleep is interrupted owing to travel or work pressure or a crisis you have to deal with, restore your usual sleep pattern at the earliest opportunity. Ideally, set your worries aside as you put head to pillow. People tell me that this is difficult. I do agree. Initially, even when you close your eyes, your mind is hyper-active and is going bang-bang-bang throwing up all your worries and playing up all your fears and insecurities. But the clothes peg approach works great here. Imagine you have a clothes peg next to your bed. Before you sleep, you will probably remove your day clothes and hang them on the clothes peg. You will then wear your night clothes and hit the bed. Do the same with your worries. Hang them on an imaginary peg. Don’t worry about your worries – they will go nowhere. When you wake up in the morning, you can take them back. Train your mind, with consistent practice of the clothes peg approach over a few days, and be sure, you will begin to sleep well. Very well. Good sleep cannot solve your problems. Nor does worrying! But sleep helps – where worrying can never help – in recharging all your batteries so that you can face Life and take on your problems with renewed vigor and enthusiasm. 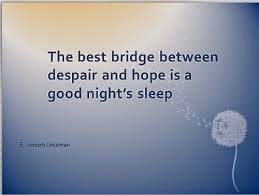 Ernest Hemingway (1899~1961), the legendary American author, champions good sleep thus: “I love sleep. My Life has the tendency to fall apart when I’m awake, you see?” The big moral here: It’s not worth losing your sleep over anything!